Manila, Nov 13: Prime Minister Narendra Modi tonight held separate pull-aside meetings with US President Donald Trump and Chinese Premier Li Keqiang on the sidelines of a gala dinner to mark the 50th anniversary of the ASEAN. Modi also tweeted pictures of his interaction with several leaders. 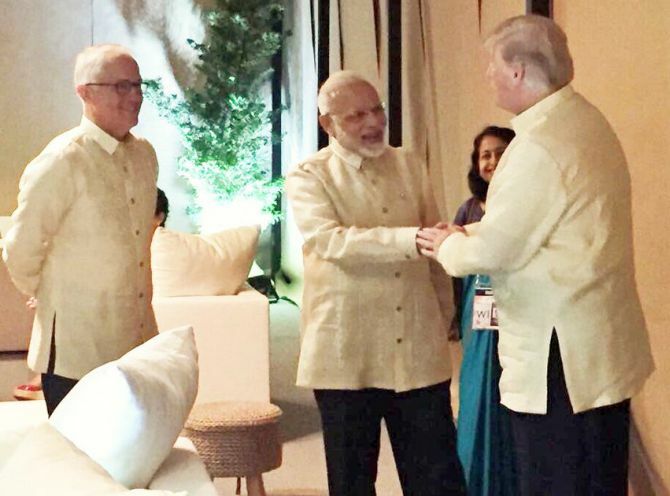 The brief interaction between Modi and Trump came ahead of their scheduled bilateral meeting tomorrow. The two leaders are expected to deliberate on a number of key issues of mutual interest including the evolving security situation in the Indo-Pacific region where Washington favours a greater role by India. "PM @narendramodi had a warm and cordial conversation with the Chinese Premier Li Keqiang at the Gala Dinner," MEA spokesperson Raveesh Kumar tweeted.